A phenomenon once considered nearly superfluous, the trend of recycling, as on today, has emerged as one of the most urgently indispensable requirements, given the mammoth amount of waste accumulated across the globe, alongside the likes of plastic, metals, wood, paper and paperboard, and glass. Estimates related to the waste indeed provide a vital testimony to the aforementioned fact – according to the National Environment Agency, in 2017, close to 7.70 million tons of solid waste was generated, while the amount of waste recycled stood at 4.72 million tons. The NEA cited that waste generated due to construction debris, plastic, and paper/cardboard was pegged at 1,609,300, 815,200, and 1,144,800 tons respectively in 2017, while recycling rate for the waste types stood at 99%, an outrageous 6%, and 50%. A report published on the National Geographic last year claims a vast proportion of plastic waste – over 76%, to remain nonrecycled, naturally finding its way to landfills and the oceans. The study also affirms that if the present trends continue, there will be approximately 12 billion metric tons of plastic accumulated in the landfills, by 2050. Quite overtly, the amount of waste generated and the amount recycled stand miles away from each other, a state of affairs that has led to treacherous disarray in the world’s arable lands and more specifically, the water bodies. The severity of the issue in hand has been under serious scrutiny in the last couple of years, as is evident from the numerous recycling initiatives that are being adopted to minimize the risks of harmful waste, specifically plastic, on the environment. The annual International Coastal Cleanup affirmed the acuteness of plastic pollution on coastal U.S. in 2017, when over 3.7 million pounds of trash, majorly comprising plastic, had been collected by a humongous 209,643 people on a single day. Food giant Nestlé recently revealed that it plans to make 100% of its packaging recyclable/reusable by 2025, specifically focusing on avoiding plastic waste. By Q1 2019, the firm plans to roll out paper packaging for Nesquik while the Yes! brand would be the recipient of paper packaging by second half of 2019. 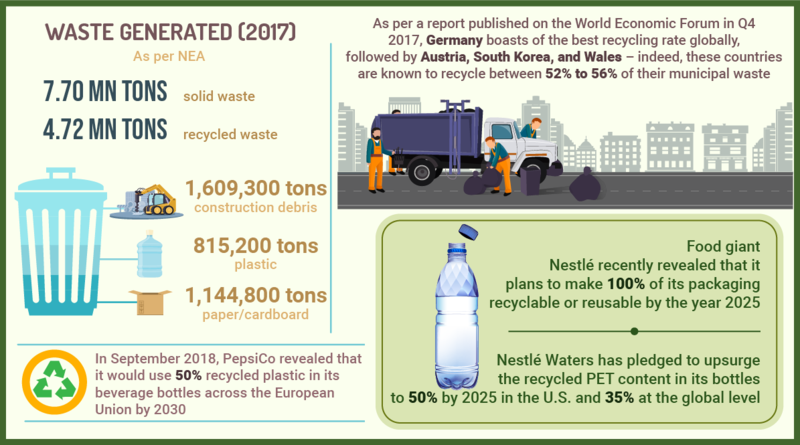 Nestlé Waters has also pledged to upsurge the recycled PET content in its bottles to 50% by 2025 in the U.S. and 35% at the global level. Popular beverage industry giant The Coca-Cola Company poured in a substantial amount last year to accelerate the deployment of recycling technologies in a bid to convert recycled plastic into food-grade PET to be used in its beverage bottles. Popular flexible packaging leader TC Transcontinental Packaging, in collaboration with Harney & Sons, has recently launched a multilayer barrier, first-of-a-kind, 100% recyclable, stand-up pouch. The multilayer recyclable pouch along with barrier has brought forth a unique sustainable product to the packaging industry, simultaneously protecting the flavor and freshness of the product. A while ago, China’s environment ministry has brought forth a pilot program for waste-free cities. Reportedly, the program targets a highly efficient deployment of resources and plans to eliminate the growing health and environmental risks resulting from trash. Currently encountering a solid waste backlog of over 60 billion tons, the nation aims to tap the new program to curtail the amount of waste generated and enhance treatment rates, eventually encouraging new green development methods and lifestyles for reducing the environmental influence of waste and minimizing landfill volumes. In May 2018, the UK-based supermarket Tesco decided to impose a ban on its non-recyclable packaged products, aimed toward reducing the plastic utilized in packaging its own brands. The September of 2018 saw beverage conglomerate PepsiCo announcing its decision to use 50% recycled plastic in its beverage bottles across the European Union by 2030. Close to the end of the last quarter, in December 2018, fast food giant KFC made it to the front page for announcing its partnership with Graphic Packaging to supply 500,000 sustainable food buckets for the Big Bash League 2018. The first quarter of 2019 begun on a positive note for the recycling industry as far as electronic stalwarts are concerned. Electronics giant Samsung declared that it plans to replace the plastic packaging used in its products with environment-friendly components, starting this year. The involvement of governmental bodies has led to numerous geographies taking the lead on recycling trends across the globe, given that the disastrous impact of nonrecycling has generated jitters worldwide. As per a report published on the World Economic Forum in Q4 2017, Germany boasts of the best recycling rate globally, followed by Austria, South Korea, and Wales – indeed, these countries are known to recycle between 52% to 56% of their municipal waste. In the decades to come, the trend of recycling is anticipated to depict an entirely reinstituted portrayal altogether, with numerous segregations and respective protocols established for different types of waste (plastic, metal, paperboard, municipal, etc. ), in conjunction with pivotal contributions from private sector enterprises and legislative organizations alike. 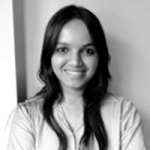 Saipriya Iyer presently works as a writer for packingmaterials.org. Having dabbled with the domain of content creation for nearly half a decade, she now boasts of an enviable portfolio, holding quite some years of experience in penning down insightful pieces related to numerous industry verticals. 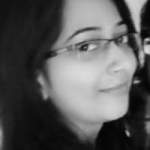 A qualified computer engineering graduate from the University of Pune, Saipriya can often be found leveraging her knowledge of the latest trends in her write-ups.